This patchwork coverlet is not as old as many in my collection, and would strictly be classified as “vintage” rather than antique, as it is less than 100 years old. It was made by a relative of mine, Mrs Illona Jones. 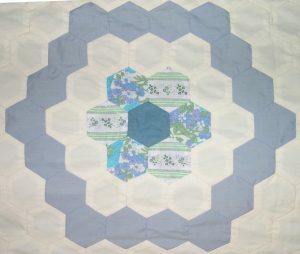 It is a good example of the revival of patchwork and quilting which began in the 1970s – and uses a style of patchwork which has been popular for far longer, and will be very familiar to many who began their patchwork experience piecing hexagons over papers. 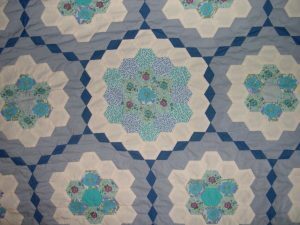 The coverlet is hand-pieced, mainly from what I think is poly-cotton sheeting in plain cream, mid-powder blue and royal blue which unify the mixture of floral cotton dressmaking fabrics mainly in turquoise, with accents of blue, pink and purple used for the rosettes. The hexagons are arranged in a popular design known as Grandmother’s Flower Garden, in which rings of different colours are placed around a central hexagon. The coverlet is well-designed, both in its shape, where the hexagon layout has been designed to make it gently fitted to a single bed, and in its placing of colour, which is planned and balanced. On the part of the coverlet which goes on the bed surface, there are three rows, each with six Grandmothers Flower Garden units. 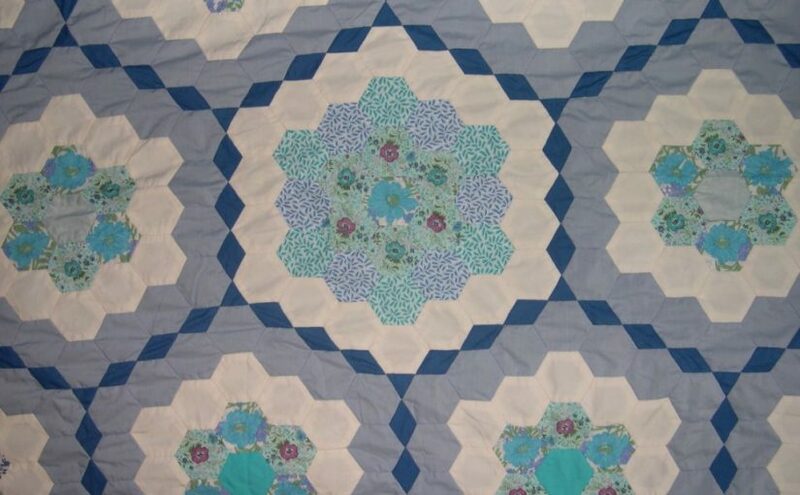 Each rosette of floral patterned 2” hexagons is surrounded by a ring of first cream, then powder-blue hexagons. The only exception to this is the unit at the centre, which has an extra ring of floral hexagons, then the cream, with no powder-blue ring. In an unusual variation on the basic design, the Grandmothers Flower Garden units are surrounded and joined by lines of 2” long royal blue diamonds, with 1” equilateral triangles at the junctions. 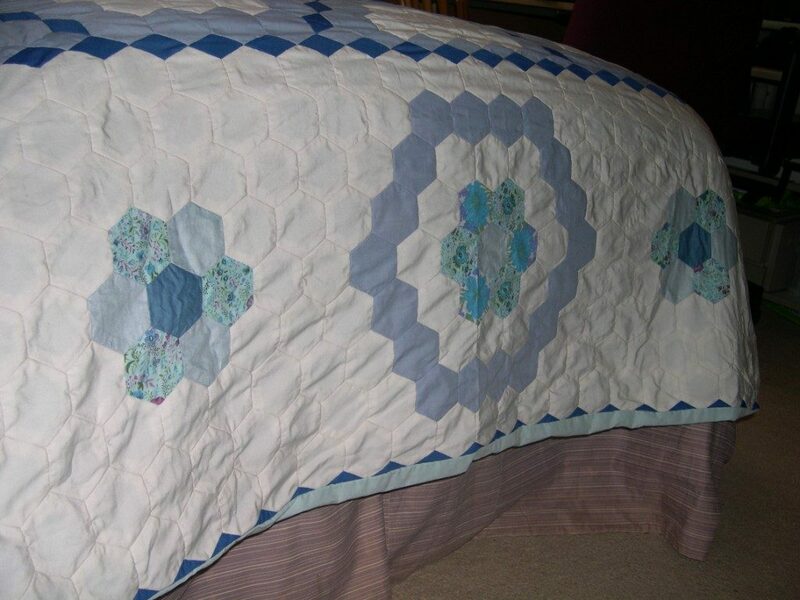 The parts of the coverlet which hang down the sides of the bed have a background made up of cream hexagons, into which are inserted alternate three ring and one ring Flower garden units. The only royal blue elements on the sides are a row of half-diamonds which finishes off the bottom edge, and a row of diamonds down the two shaped bed corners, joining the gradually extending side borders of cream hexagons. This corner shaping is cleverly designed to give a fitted, but not overly constrictive profile. The border areas flow seamlessly over the foot of the bed, but close inspection reveals a more forced fit onto the sides. The royal blue diamonds appear to have been appliqued on top of the partial rosettes down the side of the centre pane. 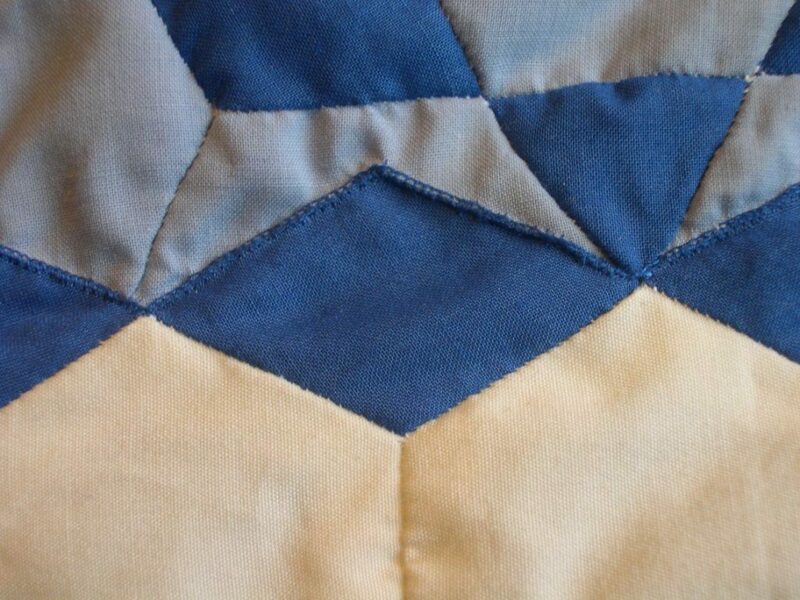 There are odd shapes required which would be difficult to stitch with the English paper piecing technique used for the rest of the coverlet – the applique method avoids attempting to stitch inset corners. The side panels are joined on by applique, rather than conventional piecing. 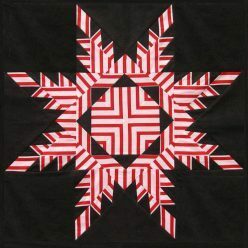 This stitching has clearly been done from the right side (rather than the reverse as with the rest of the English paper piecing), and is either hand stitched with a tightly spaced variation on blanket stitch, or possibly machined with an unusual zig-zag stitch. This applique finish has partly been chosen because of the “bagging” method used to add the backing made from plain aqua fabric – again probably sheeting. The lining must have been stitched onto the border sections all round the bottom edge, and then turned inside out before the top of the sides were stitched over the edge of the top panel. 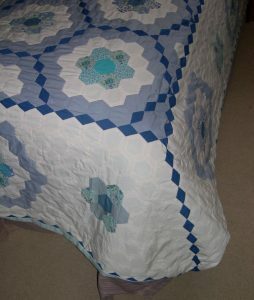 There is no wadding (hence this is a coverlet, not a quilt), and no quilting, meaning that the lining shifts a little with respect to the patchwork top, and can occasionally be seen at the edge. The quilt was given to me by my father’s cousin, John Jones (known in the family as Johnnie). The patchwork coverlet had been made by Johnnie’s wife, Illona while living in Woodbridge, Suffolk. I have a letter from Johnnie, detailing some of her history, and the rest has been pieced together with the aid of Find My Past. Illona had been born in Hungary in 1925, and was one of two daughters of a Professor of Medicine at Budapest University. Orphaned by a bombing raid in Hannover during the war, she came to the UK with a British solider Henry Shepherd, whom she had married in Germany in 1947, but this marriage was not happy, and presumably after a divorce, she married Johnnie in 1975. Illona died in 1995. 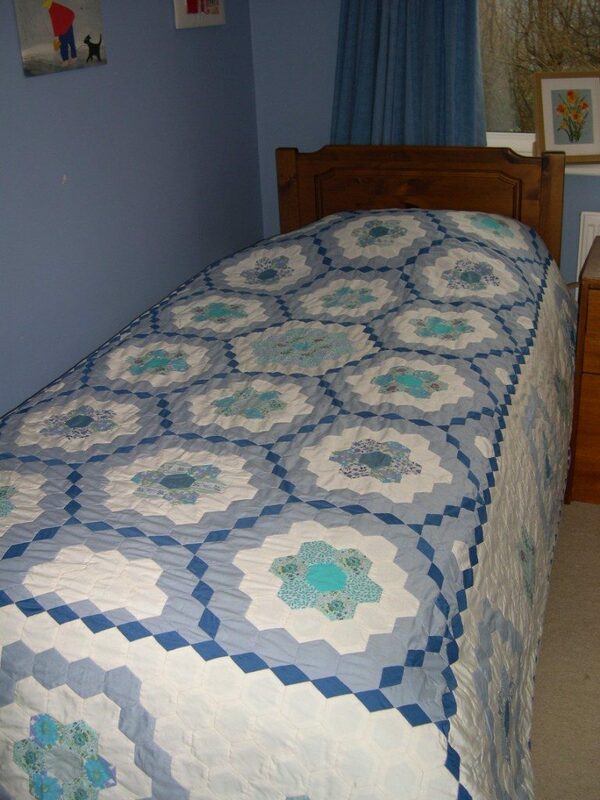 How she learnt patchwork, or when she made this coverlet is not known – as it fits a single bed, I would estimate early 1970s before her second marriage.